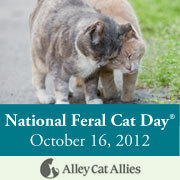 Alley Cat Allies is celebrating National Feral Cat Day.... TODAY!!! And there are the cats we have trapped in the neighborhood over the last two years - and the kittens that we caught and have been adopted. 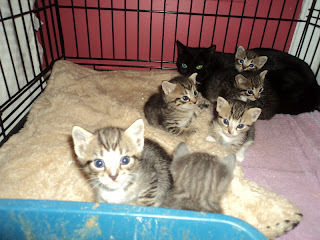 Bug's mom was TNR'd, so was Doc and Sally's mom and the memorial day kittens. Not only have the kittens found home (or are looking), the adults are no longer able to reproduce and are being cared for the best we can (shelter and food). And there are so many other ways to help. And every little step takes us one more step closer to a day when ferals are not killed for being feral. If it weren't for Alley Cat Allies none of us would be safe and loved today! Thanks for all you do. That is so true, looking for the day when feral cats are not killed for being feral. You do such a good job with the TNR Jeanne. And what a difference it makes. Keeps them off the streets. Take care. 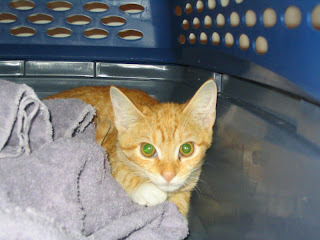 If it wasn't for people who trap and rescue feral kittens, we wouldn't have our wonderful Kip!!!! We love all feral kitties and try to do our best for them every single day! Wonderful info! 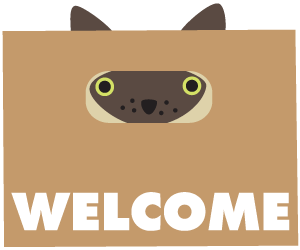 Thanks for visiting us. May one day all feral be understood and cared for. Yeah feral cats deserve a fair shake too, awesome all you do. Wonderful info! You'll love our feral cat photos and Q & A with an amazing rescuer and photographer! We learned a lot from your post today! 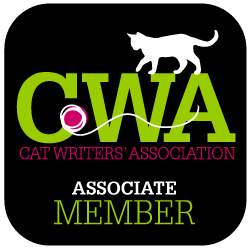 Thanks for all the info - and for all that you do for feral kitties! SIXTEEN pounds?!? MOL, yeah and allllll menace too. Happy Feral Cat Day - isn't it pawsome how many peeps are beginning to support TNR? We hope that continues to grow, too. I always have and always will admire and be grateful to you for what you do for the innocent and helpless out there. We're glad the Orange Menace has such a great home! We happen to think that former ferals make wonderful kitties and can become sweet lapcats. Just ask Leo! While I've had numerous cats over the years, and two of the current trio are rescues, I've never heard the term TNR. I'm guessing, trap, neuter, release? Regardless, I'm amazed at the work you do for these wonderful animals. On their behalf, thank you! We are big fans of TNR and Alley Cat Allies! Great post, we love TNR! Its the only way to go for our feral cousins! TNR is slowly but surely catching on here. We don't have low cost clinic close so Mommy asks for rescue rates at the private vets. Hopefully one day there will only be happy endings like these! Our favorite pet store donate 500lbs of cat food to our local TNR program and then matched every pound donated by their customers...they ended up with 700lbs of fodd! Woohoo!